A stick is a stick. You can do almost anything with a stick. A very small stick can get something unstuck from your teeth. A very large stick can be used to make a trap to crush a man or vehicle. You can use sticks in their natural condition to build simple devices. You can shape and form big sticks into wooden forms and devices like bows and arrows, bowls, cups, plates, and utensils, boards for building a house or making furniture, or one of my favorites, gun stocks. In essence, a stick is just wood. Look around you, wood is used to make a lot of items in your everyday life. I spent about 20 years making things from wood as a carpenter. I did everything from framing houses up to building lavish, ornate wood work inside mansions. You can build a simple fence or log cabin from sticks and logs in their natural state. Or you can cut the logs into boards and build a modern fence, barn, or even a home with the wood. You can even bend and shape the stick or wood using hot water or steam for making everything from bentwood rocking chairs, or the ribs for a canoe or boat. Green sticks can be bent into shapes and left to dry, like making hoops for building fish traps or baskets. A stick is such a versatile and useful object, invaluable even. 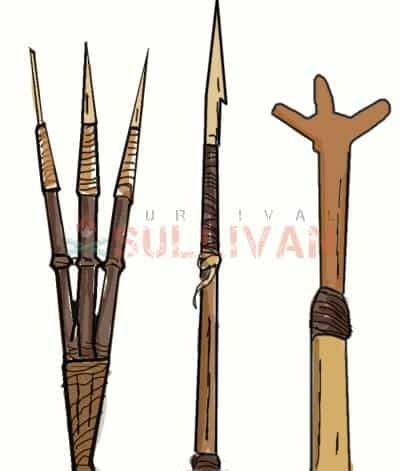 So let’s look at some exact items that you can make with sticks in your survival or bush craft life. If you are in the forest in a survival or bug out situation, or you have just decided to go live off the grid, weapons will be a vital part of your survival. Starting with the most basic form you can make a spear from a long, straight, sharpened stick with a fire hardened tip (tip alternatives shown). You can make a Stone Age hatchet. Just take a stick about 2 feet long and about 1 1/2” in diameter. Split the end down about 8 inches. Wrap the stick to prevent further splitting. Shape and sharpen an axe head by knapping, then insert it into the split leaving a couple inches of the end of the stick exposed. Wrap the end and crisscross around the axe head to hold it in place with lashing. The tighter you wrap it the better it will be. If you have some leather, wrap it with wet strips and when it dries it will cinch tighter. You could even try your hand at making a bow and arrow. If you have a knife, you can use that. If not, use the hatchet you just made. Get a 2 inch thick straight branch about 6 feet long, and split it in a way so that it has heartwood (the denser wood in the center) on one side and sapwood (the greener wood closer to the bark) on the other. This gives it a springy effect. Leave about 1/3 of the overall length in the center the full width and thickness, and from there taper towards the ends until the ends are about 3/4″ wide and 1/2″ thick. Cut angled notches on the ends for tying the bow string (these notches are called nocks). Make a bowstring about 2” shorter than the bow, make it from paracord or make fiber cord from plant material. Make arrows from the straightest sticks (actually small saplings work best. Cut them off several inches above the ground. Try to leave at least one green, living leaf so it will keep growing), reeds, or bamboo shoots, just whatever you have available. Heat temper the ends to harden them for points, or make arrow heads for them. Fletch them (feathers) with split bird feathers, plant material, or whatever you have available. You can even make cord from sticks, if you use the right sticks. Just find dead wood with hanging bark. Peel the fibrous layer between the bark and wood out, and twist weave them together. Cedar and Poplar are both good trees for this and they are pretty much all over the planet. It takes some practice, but if you can get it down it is an invaluable skill to have. Another method of making cord relies on finding plastic bottles like 2 liter bottles. Unfortunately, man has left so much garbage that these are often washed up on banks and shorelines. To make cord, cut the bottom off. Then start peeling it like an apple, cutting an even strip all the way around the bottle. This makes a very strong cord. Cutting it thin makes fishing line, cutting it wider makes strong cordage for binding and lashing. After you lash with it, if you heat it gently it will shrink and so draw up tightly. A bow drill is good for making fires and, well, drilling holes. The same bow works for both, but you need different sticks for fire making and hole drilling. You have to make stone or metal tips for the stick in order to drill holes, but for making fires you just have a dry wooden stick. You gotta eat. In the survival situation you can hunt for food with the bow you just made, and you can trap with it. There are several types of traps you can make using sticks. You can use green limber sticks to make a whip snare. You can make a stabbing trap by lashing sharpened sticks to a springy sapling or branch. The size of the trap depends on the size of the quarry. If you wanted to try to get a deer or wild pig, you would make one using a sapling 2-3” in diameter at the ground. Cut the sapling off about 3 feet from the ground (for a deer), and lash 2 or 3 sharpened sticks on it about 18” long. Use sticks about an inch in diameter and sharpen them by tapering them to a point and fire hardening the tips. Bend the stick back, and fix it to a trip line along a deer path. When the deer walks through and trips it, they will be injured. This trap typically won’t instantly kill the animal, but it will wound the animal and you will have to follow a blood trail to find it. If you have bamboo wood, you can make a hollow spike designed to come off the trap and remain in the animal. This will create a bloodletting tube that will allow the animal to bleed out faster. 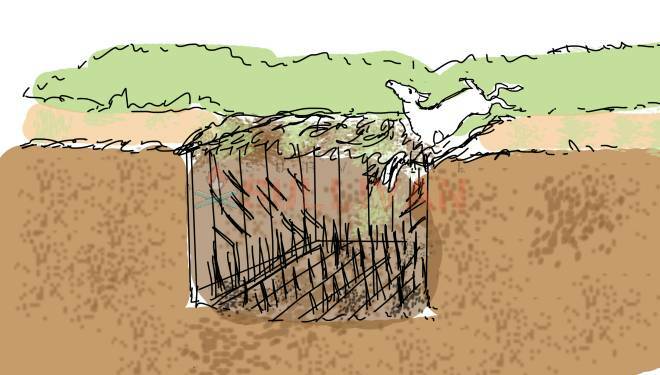 Another type of spike trap is a punji pit. This is simply a hole lined with sharpened sticks. It is covered by making a weak mesh of thin, dry sticks and then covering it with leaves. This type of trap is more often used for man traps by injuring their feet and legs, but if you want to dig a hole big and deep enough to trap a large animal, it will definitely work. You can use sticks to make live traps to catch fish and small game. One way to do this is a funnel trap. Start by making hoops from green wood of descending sizes. Make a long cylinder shape about 4-5 feet long that starts about 18” around for the first half and then tapers to a point, closing the pointed end. Make it with sticks about 1/2-3/4″ thick. Then place them so they are only about 2” apart, so anything decent sized can’t get out between the sticks. Then make another cylinder that is only about 2 feet long, but is about 12” around and tapers to a point (except leave the pointed end with about a 6” opening). Insert this shorter tube inside the longer tube, and lash them together. Fish or animals that go in will typically not be able to figure out how to get back out, and so will be caught. There’s a few different fish traps you can try with wood. If used for trapping small animals, you can place bait inside to attract the animal. Be cautious when approaching the trap, as there could be a skunk or raccoon in it. Skunks will spray you, and a raccoon will tear you a new one. If used for trapping fish, try to position the trap with the opening facing upstream. Use more sticks to drive into the creek bed to make a “V” shaped fence to direct the fish into the trap. If you think there are very large fish in the waterway you can make a larger trap. Stake the fish trap to the creek bed so it stays in place. If you are homesteading you can make a simple fence by driving sticks 2-3” in diameter at least a foot deep into the ground for posts. Drive them in the ground about 2-3feet apart. 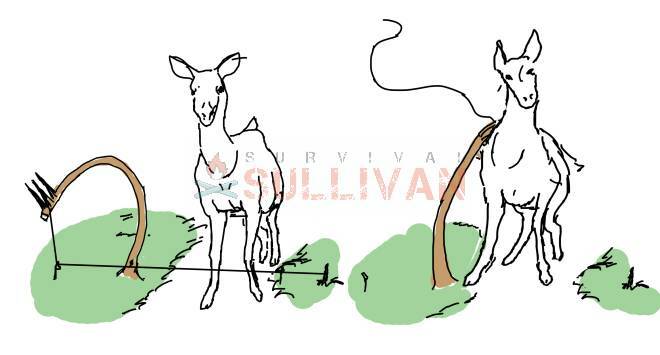 Depending on the size of the animal you plan to corral, you may need to use thicker posts and put them deeper into the ground. The height of the fence also depends on the size of the animal you plan to corral. 4-5 feet tall will suffice for most. Once you have driven your posts into the ground around the perimeter, and then simply weave sticks in and out of your posts. The thickness and spacing of these sticks depends on how sturdy you need the fence, but usually 1-3” in diameter will do fine. Apparently this type of fence is called a wattle fence. I actually had no idea what it was called. I just knew how to make it and it is effective. Learn something new every day, I say. You can actually build a shelter in this manner as well. Start by digging holes 2-3’ deep, and then set 6-8” diameter posts in them for the corner posts and on either side of door openings (so the structure will be fairly sturdy). Use 2-3” diameter posts along the walls every few feet, then weave between these posts just as for the fence. You can put the roof on in this same manner, just by lashing poles at the corners and leaning then in to the center and lashing them together. Use smaller poles along the wall, and lash them into the center, then weave in and out the same as the walls. Once the walls and roof are up, seal them by rubbing a mixture of mud and grass on them (adobe). To really insulate, them do the inside and out. If you want to get fancy, you can make shelves by inserting sticks (3 per shelf) into the weave of the wall before you mud it, and let them stick out (no pun intended). Then weave small sticks around them for a shelf. You can make dishes and utensils from sticks too. Okay, technically you need small logs for this. You just cut off a chunk, and dig it out with your knife (or a rock) to make a bowl or cup. You can even cook soup or tea in these wooden bowls and cups by heating clean rocks in the fire, and place them into your bowl or cup of liquid. Heat several stones at once. This way you can put them in one after the other. When the liquid cools the hot stone, take it out and put another hot one in. After a few stones, your soup will be hot. To make utensils, you just use a stick about 2” thick and shape it into a spoon or a fork. Like I’ve said before, the best tool you have is your brain. Whether you are in a survival situation, or just wanting to live off the land, everything you need is right there for you. You just have to know how to utilize it. When you enter the woods, if you happen to have a knife, that’s great. But if you don’t then just find you a good rock and crack it so it has a sharp edge, then you have a cutting tool. Make a hatchet, then make a bow, then make a fire, etc. etc. Everything you need is right there. You just have to see it. When you look at a pine tree what do you see? I see pine nuts for munching on. I see pine needles for making a vitamin C rich tea. I see pine pitch for sticking things together and making fire. I see pine bark fiber for making cord. I see pine wood for making fire. I see plentiful thin, straight low hanging branches for making traps. I see dead needles on the ground for making a nice soft bed to lie in. If you find yourself suddenly in the woods, don’t panic, nature will provide. Your first and foremost goal is to find water. Then shelter if it’s cold and/or raining and/or snowing. Of course, if it’s snowing or raining, there’s your water so focus on making shelter. Amazingly, underneath that big pine tree will be a lot drier than you’d think. If the weather is mild then find food. When you have food and water, then you can start making tools and weapons to make life easier. Of course, if you may just want to get out of the woods and back home because you’re just lost. You’ll still need water and food, and possibly protection. Depending on your location, my woods are fairly mild, not really a lot of scary animals like bear around here. Black bear are occasionally spotted in the vicinity, but usually they are a good 100miles away. There are big coyotes but they typically avoid humans. My point is, you can never be lost because wherever you are, there you are. You forgot a throwing stick for rabbits and other small game. 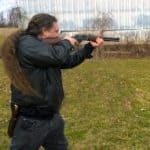 No, I didn’t “forget” it, I discussed that in another article, “Primitive Weapons”, check it out. I try not to use the same information twice, that’s why it isn’t mentioned here. Thanks for reading. Though am quite familiar with most of these, I simply love it! Learned new things! And as Filipno Martial Art advocate, we use the stick of different make an design as a weapon for combat and for sport. That is interesting to read, thanks for posting Fil! Thank you for the Positive feed back Fil, I am glad you enjoyed it.